Welcome to the 2015û2016 PW/Horizons Bible study, Come to the Waters. Water plays a central role in the stories of scripture, from the chaotic waters of creation to the River of Life in Revelation. Sometimes there is too much water (think Noah); sometimes there is too little water (think drought in the desert). In this study, we explore some of the BibleÆs more than 800 references to water, including the delivery of GodÆs people through the parting of the Red Sea and the crossing of the Jordan River, the judgment of a people weak in faith and the adoption of the people of God through baptism. 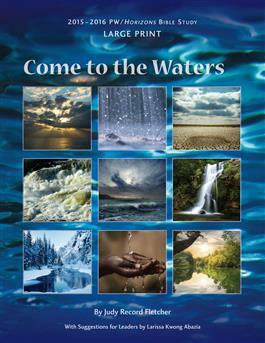 The rich imagery of water throughout the Bible helps us understand and articulate our faith. Just as water nourishes our bodies, so the scriptures on water nourish our souls. Join the hundreds of thousands of thoughtful Christians who will be sharing this study together in the coming months. This study is available in several editionsùEnglish, ecumenical, Spanish, large-print, video and audio. All editions and supplements, as well as other related materials (promotional poster, pendant/charm and workshop for leaders), are available. Type ""Come to the Waters"" into the search box to bring up the entire list. Additional resources are published in Horizons magazine beginning with the July/August issue.